Plus: How much money has the HSE spent so far this year? €8,321,000,000: The amount of money that the HSE has spent so far this year. 140,000 – The number of fixed charges notices An Garda Síochána handed out for speeding to motorists in the first nine months of this year. 8,000+ – The number of responses to a Greek charity after it appealed to the public to try and identify the blonde child taken from a Roma settlement over concerns about her identity. 3,800 - The number of people who became Irish citizens at a ceremony in Dublin’s Convention Centre this week. 491 – The number of perinatal deaths in Ireland in one year, according to the first ever national audit. $49 – The amount that people in the US can pay for imported peat briquettes so that their homes can smell just like Ireland, if, for some reason, that’s what they want. 41 – The number of years since 13 people were killed on Bloody Sunday in Derry. The PSNI said this week that it is to question witnesses as part of a new murder investigation into the killings. 40 – The number of years that David Norris had had a beard before shaving it off for charity this week. 25 – The percentage of 3-year-olds in Ireland who are obese or overweight as a new national campaign aims to tackle childhood obesity. 19 – The number of words the London Independent devoted to the christening of Prince George this week – in sharp contrast to other British newspapers. 12 – The number of months that a man has been sentenced to spend in jail in Liverpool after he called in a hoax bomb threat to his wedding venue, rather than admit to his wife-to-be on the day of their wedding that he’d neglected to book it. Oops. Email “Prince George, peat briquettes and David Norris: The week in numbers”. 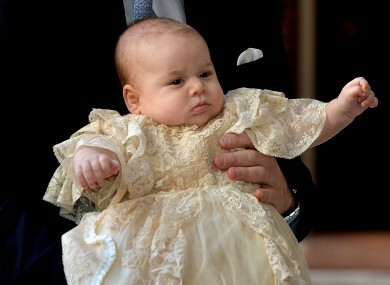 Feedback on “Prince George, peat briquettes and David Norris: The week in numbers”.